President Barack Obama has given the Presidential Medal of Freedom to Joe Biden. Obama called him "the finest vice president we have ever seen." Biden winced in shock Jan. 12 as Obama announced he was awarding the nation's highest civil honor to his right-hand-man of eight years. Biden turned away from the cameras. He wiped away some tears. Then he stood stoically. Obama draped the blue-and-white ribbon around his neck. There were several standing ovations. The event had been billed as a modest farewell ceremony for Biden. But it evolved into a surprise. That surprise was the awarding of the Medal of Freedom. It was the last time Obama will present the honor. Obama was joined by his wife and daughters. He was gushing in his praise for Biden. They ran for president against each other in 2008. Then Biden agreed to be his running mate. Obama said Biden had made him a better president. He called Biden "a lion of American history." Biden is famously plainspoken. He has long said he only agreed to be vice president after Obama agreed he would be the last person in the room before major decisions were made. They developed a bond over the two terms. Their wives, children and Biden's grandchildren became close friends. They disagreed sometimes. Once was when Biden spoke against the high-stakes raid that killed Osama bin Laden. Biden's tendency to veer off-script caused occasional headaches for the White House. For instance, when he unexpectedly announced support for gay marriage. That came in advance of the 2012 re-election. It forced Obama to do the same. Obama traced the history of Biden's nearly half-century-long political career. Biden chaired the Senate Judiciary and Foreign Relations committees. Now he has started the "cancer moonshot" effort. Biden plans to continue that effort, which is to end cancer. Obama praised his vice president for his work on several efforts. One was the economic stimulus. Another was curbing violence against women. Biden's career in Washington started in 1972. But it began in tragedy. That is when his wife and infant daughter died in a car crash. It happened just before he was to be sworn in as U.S. senator. He plans to stay active in Democratic politics and work on policy issues at a pair of institutes he's developing. Those are at the University of Delaware and the University of Pennsylvania. I never realized that Joe Biden's wife and daughter had died. The fact that he plans to stay in Democratic politics is cool. Especially since he started his career in 1972. I believe that Joe did indeed deserve the medal. Joe Biden seems like a brave strong man of our government who has kept moving through all the tragedy he and our country have faced. Joe Biden deserved the award a hundred and ten percent. Obama knew that Biden had helped him and kept our country strong through all the rough patches. It is pretty cool to see him earn that medal he has work so hard to get where he is now. Being a lion means he is prowed to help his country. Personally I think that this article tells a lot about Obama and Joe Biden. It shows how Obama is thankful for having Biden in as Vice President. I believe President Obama meant by his quote "a lion of American history" that Biden was a warier and lived his life fully. This opens my eyes to how close the president and vice president can be especially with family. President Obama means Biden has done so much that he made a mark. And he has pride like a lion meaning he is a lion of American history. So let his roar run over the U.S with the honor of the medal. 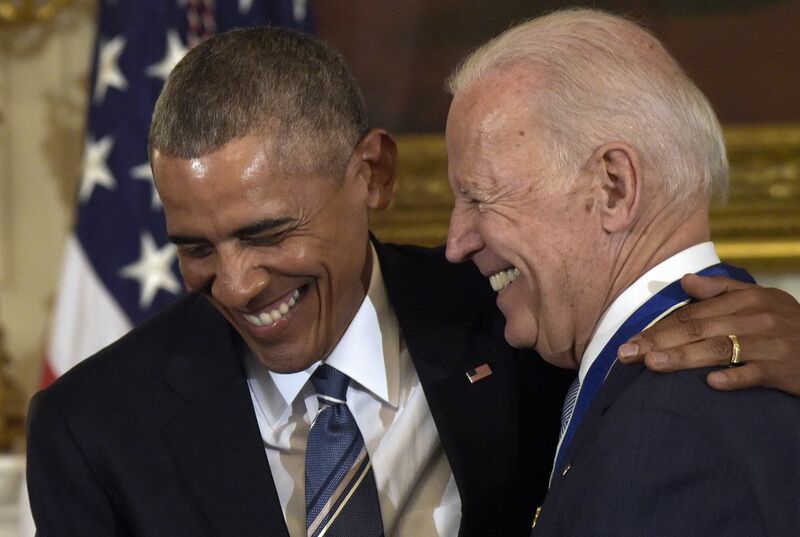 President Obama has awarded Vice President Biden the Presidential Medal of Freedom for being the "finest" Vice President he has seen. 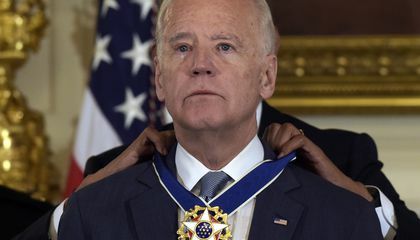 Biden was very grateful to receive such an honorable award in his political career. President Obama called Biden "a lion of American history" since they ran for President against each other in 2008, then had the opportunity to be running mates. President Obama and Vice President Biden have worked well together the last 8 years. President Obama meant that Joe Biden was a lion because he's a proud vice president who always stands up for what's right. for example he didn't want the soldier's to do a risky mission to kill Osama. standing up for gay marriage. I think Joe Biden definitely deserved the award. Biden helped Obama keep our country strong. Biden also pushed through a personal tragedy and still stayed strong for his country.